There are over 10,000 known species of ants. Ants form colonies that are highly efficient and divided into specified groups depending on what they contribute to the colony as a whole. Anatomically, an ant’s body, like all insects, is essentially made up of three sections: the head, the thorax (middle part), and the abdomen. What distinguishes ants from other insects are their elbowed antennae and their small, knob-like structures called petioles that connect their thoraxes to their abdomens and function as waists. As social insects, ants live in large colonies. The number of colony members, which can range from a few hundred to a few million, depends on two main factors: the size of a livable area and the available resources to exploit. The queen is responsible for laying eggs and increasing her colony’s population. Drones, or male ants, provide the means for reproduction. 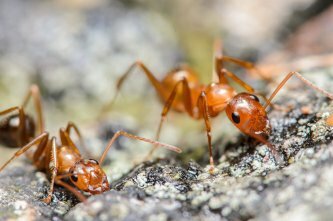 Worker ants are tasked with caring for eggs and the young, increasing the size of their nests, and foraging. These are the ants you would typically come into contact with. Soldier ants guard the nest against intruders and other threats, and possess larger head features like intimidating mandibles. When ants infiltrate your living spaces problems arise. The odorous house ant ( Tapinoma sessile ) and the black carpenter ant ( Camponotus pennsylvanicus ) are common pests in the United States. House ants are fairly harmless and usually come into homes when food, specifically sweet food, is accessible. Their presence inside is more annoying than anything else. Carpenter ants, on the other hand, can be of particular concern because they create their nests in wood. Therefore, a large colony could severely damage your home’s wooden joists and studs. If that is the case, you should hire an ant exterminator immediately. Call (847) 529-2847 for reliable ant extermination services in Northern Illinois. 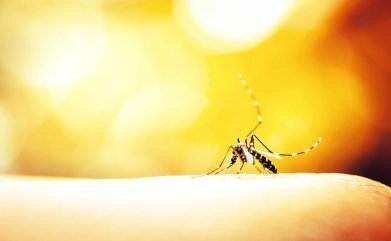 When you are in need of mosquito control, bug extermination, or other types of pest control in Crystal Lake , it is important that you contact a qualified pest control service to handle the job. Working with the right company can provide you with immediate peace of mind as well as protection from structural damage and health hazards. Keep reading if you would like to find out why you should count on Schopen Pest Solutions for all of your pest control needs. Schopen Pest Solutions has spent the past two decades honing their skills and creating effective treatment plans for the Illinois and Wisconsin area’s pest problems. Over this time we have developed countless positive relationships and done our best to leave our customers satisfied with their results. We are only able to do what we do because of the positive feedback and continued loyalty that we receive from our customers, and it is our mission to repay them in the form of high quality pest control services. If you experience a rodent, mosquito, or other pest problem on your property, the team at Schopen Pest Solutions is happy to handle your issue in a safe, effective, and permanent manner. While certain types of ants may be relatively harmless, carpenter ants tend to warrant an immediate call to your local pest control company in Crystal Lake. Prompt attention from a professional pest control service can help you avoid the costly repairs associated with structural damage to the home. Watch this video for tips on identifying carpenter ants so that you can recognize these pests should they invade your home or property. Carpenter ants are sometimes confused for termites due to their tendency to inhabit wooden structures; unlike termites, however, carpenter ants do not feed on wood. These ants use their large mouths, or mandibles, to burrow through wood and create tunnels. You may notice red or black carpenter ants, or you may see a combination of both colors. These types of ants tend to be large in size; depending on their caste or species, they may range from 6 to 20 millimeters long.